Though the GT Omega Master XL (XL-M003A) has been designed with larger users in mind, that isn’t to say that it can’t be used by just anybody. However, the design caters best for people who are less comfortable in smaller chairs, with increased dimensions and specialized features that center around the expectation of supporting a heavier load. 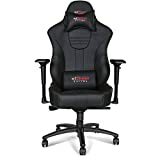 For its intended purpose, we find this to be a solid gaming chair that anybody can use with comfort, but one in which larger users will feel most at home. The GT Omega Master XL makes no apologies for the fact that it is aimed at the larger user. The design and build specification are taller, with more width, and a 150-kilogram weight limitation. The chair can be picked up in four different colours. If you choose black, you’re getting an all-black product, but if you’re after something brighter, the red, white and blue options come predominantly in black, but with coloured contours that stylise the main body of the chair, as well as the associated accessories like the head and back support cushions. Design-wise, the chair is constructed from synthetic leather, with a solid metal skeleton. Its height is fully adjustable via a gas piston system, and it can recline from 84 to 190 degrees for complete control over the level of comfort provided. In addition to being great to look at, with enough padded support around the lumbar region, head and neck it provides, it provides a good level of comfort for those who find other chairs a little on the small side. Optional accessories for the XL-M003A include 4D adjustable armrests, though whether this level of flexibility is required for an armrest is up for discussion. The armrests are vertically upright and do not connect to any kind of framing around the rear of the chair. As a result, and due to the full range of motion that the armrests have, some users have reported these being unsteady in certain positions. That being said, one plus point for the GT Omega Master XL is that it comes with a headset pillow and lumbar cushion, both included in the price, and both of which are styled in the same colour as the chair that you choose. In its quest to be the ideal chair for the larger gamer, the Master XL inadvertently causes headaches for those of us who aren’t in the upper 5 foot to 6-foot range. Even on its lowest height setting, the XL-M003A can be a little domineering, and users as tall as 5″12 and 6″4 have reported their feet being unable to rest flat on the floor on any other setting. If you’re a fairly short person, it would be worth trying to find a way to test the chair out before buying. However, for the average guy or girl, it shouldn’t be too much of an issue.